. . . keep your promise! Congratulations big sister Molly on graduating from Kettering University! Now the lifelong education starts which no school or curriculum can offer. At the end of this week we traveled to the Ashanti Region to visit Kumasi and some of the surrounding villages. We began our travels just as the G8 Summit was ending and the news has been all over the importance this summit held for Africa and Ghana. The eggs and toast constant has finally been broken with some glorious french toast – syrup, cinnamon, and a delightful change. No one in our group has ever appreciated or enjoyed french toast as much as we did that morning. The heat and sun have also returned from an absence. It has been a rainy and overcast week, but the sun emerged to greet us. Before hitting the road we stopped at the Forex to exchange some money. Aljazeera News was playing and the topic was the G8 keeping promises to African aid. They reported that $25 million is sent to Africa in aid each year, but that there is an $8 million shortfall. During this summit the G8 pledged to give $60 million to fight HIV/AIDS, TB, and malaria in Africa. Will these be promises kept? We hit the road for the 5 hour trek to Kumasi. It would have been a very boring and tiresome ride, but I had my book and BBC radio to keep me company. Top stories included the role of the G8 in keeping promises and African nations also keeping promises, J.A. Kufor, President of Ghana, speaking on behalf of the African Union as chairman asking for G8 commitment, and a stunning story about female genital mutilation (FGM) in Cameroon – a boy ran from home with his younger sister to protest and to protect her from the harmful practice. Their father then went to the village council to plead with them to abandon the practice as it had taken his son and daughter away from him. The village then banned the practice and the children returned home knowing that now many girls would not have to suffer FGM. I had also purchased a novel from the University bookstore, The Last Duty. The book is about the Nigerian Civil War of 1964, which I knew nothing about in all of my studies of Nigeria. The book tells of the war and its effect from six different people’s views, all six are linked, and all six represent a different side of the story – except for the rebel view. Our first stop before Kumasi was Bonwire village where we visited a Kente cloth weaving shop. We were mobbed by children here and people trying to get us to buy their stuff. It must have been one of those tourist common spots. It was interesting to see all the Kente cloth and Eric, out bus driver, helped me bargain for a Kente cloth tie – very awesome. Some of the sellers were very persistent. One, I forgot his name, stuck with me and haggled me for a long while. He tried to sell me bookmarks, then helped his friends sell me stuff, then asked for money for his grandmother, sister, and himself – the story always changes. Gracious Living Hostel was situated on a road that I knew well. 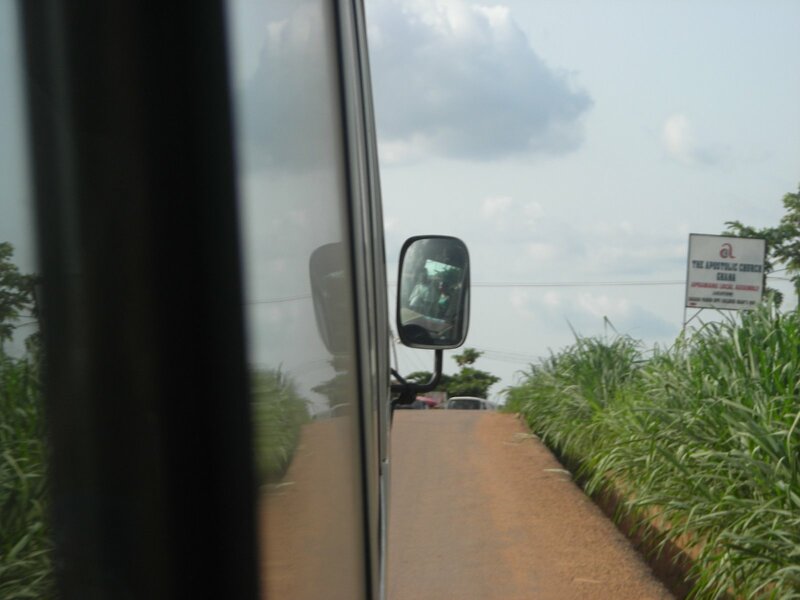 It was the typical African roads that I had come to know from Uganda and feel always in my hindquarters – not a smooth surface to be found, dust kicked in the air blinding all, and a tense body ready for the next impact. At the hostel there was some trouble with rooms and so we were a bit crowded in the beds, but hey this is Africa, we can deal. Some of us played a card game called ‘peanuts,’ but which I later found out was the game I knew as ‘nertz.’ It reminded me of some great afternoons with Grandpa. 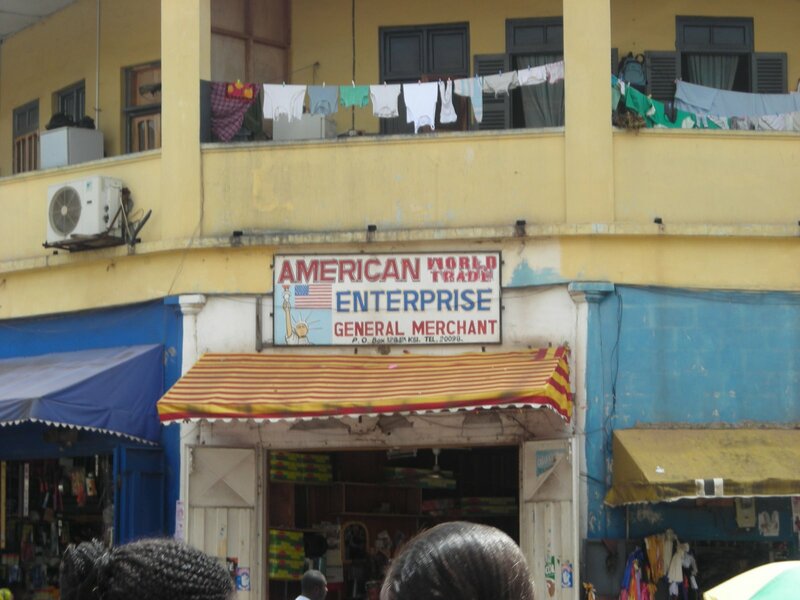 We began our day with a nice breakfast and went to the Kejeta Market in Kumasi. This is the largest open air market (in the world? in Ghana?). The market was much like Makola market, but much bigger and crazier. It was also much more fast paced and there were narrower alleyways and more grabby stall owners, there was just so much more happening. In the market is where I also witnessed the ‘travels of a t-shirt in the global economy.’ There were many stands sporting the latest Western fashions, but these were obvious imports. There were large groups of people sorting slacks, jeans, and t-shirts from piles of clothes imported from the ‘developed’ world. Afterwards we headed to the village of Kurofuforum where we learned how brass figurines are made. It is such a long and tedious process with so many steps. It gave us a new appreciation of the artwork. The man showing and teaching us had scars all over his knees and arms and could pick just about anything directly out of the fire – so calloused and hardened by his work. We then went to Bosumtwi Lake. Here we were accompanied by local fishermen on their fishing boats to swim in the lake. The fishing boats are comprised of half of a tree log, that is it. It was a very good workout to paddle all the way to the middle and a joy to swim in the, what felt like, 90 degree water. What a great experience. 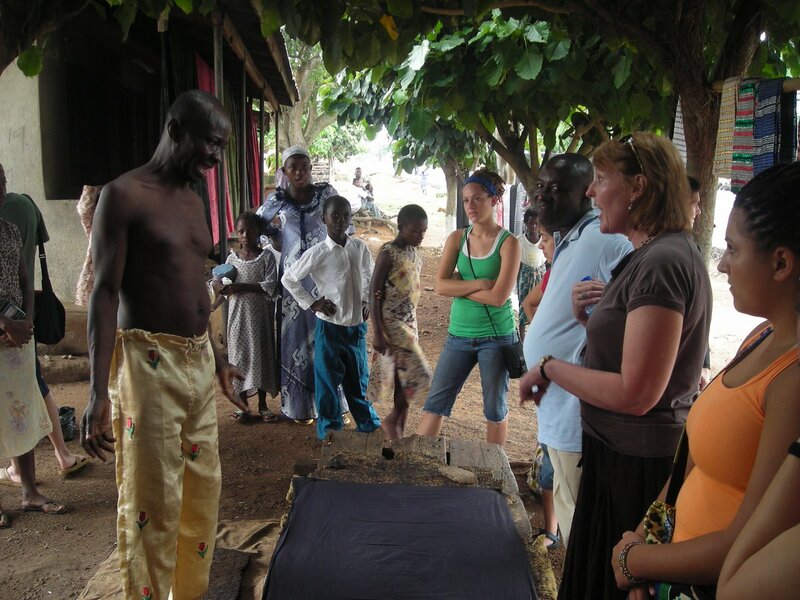 We began today by stopping at an Adinkra village to see how cloth is stamped. We bought a cloth and witnessed some of our professor’s skill at arguing and bargaining in Twi to get a good price. We then all took turns stamping the cloth to take back with us as a reminder of our trip. 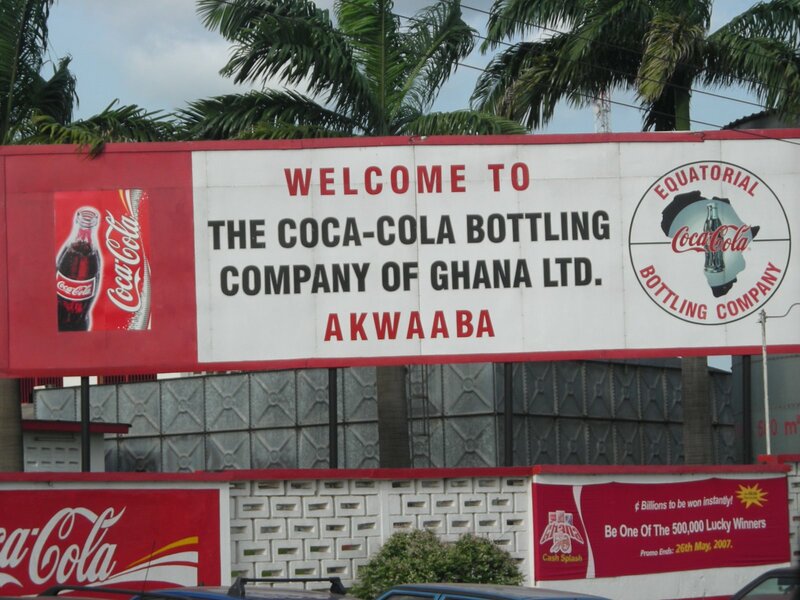 We happened to pass the regional bottling station for Coca-Cola in Kumasi. Coca-Cola is the drink of Ghana. It holds about 90% of the soda industry here against Pepsi. We visited the Royal Court and Palace Museum of the Asantehene, the ruler of Asanteland in the Ashanti Region. No pictures were allowed and the outrageous price for foreigners followed us into the compound. We were first subjected to a propaganda video about the Asante people. The video claimed that the Asante were peace loving people, yet if you look at their history it is clearly evident that they were quite to use violence and were very aggressive people who instigated many conflicts. It was very interesting to learn about the history of the Asante people from the very place where their kingdom resides. It was especially interesting to learn directly about a people that I have studied so much. On the way back to Accra from Kumasi, BBC doesn’t come in until you get closer to the greater Accra region, I finished my book and was finally able to listen on the BBC to debates about the G8 summit from an African’s perspective as callers from Tanzania and expats from other parts of the world voiced their opinions and reactions. Another interesting story was about the Burma Boys of Nigeria who fought in WWI for the British in Burma. The story was of colonized Nigerians fighting in Burma and being addressed by the Japanese fighters in perfect Hausa, one of the major language groups of northern Nigeria. This weekend we have seen the greatness of the very western oriented Kumasi and the kingdom of the Asnatehene. We were able to see part of the reason that the British gave Ghana the colonial name of the Gold Coast from the wealth of the Asnate. We have experienced a region deeply rooted in tradition, powerful traditional rulers, and great wars with imperialist countries. On the way to Kumasi our professor commented on how much has changed since the last year. She noted that there was so much money flowing into the country now as opposed to just a year ago. 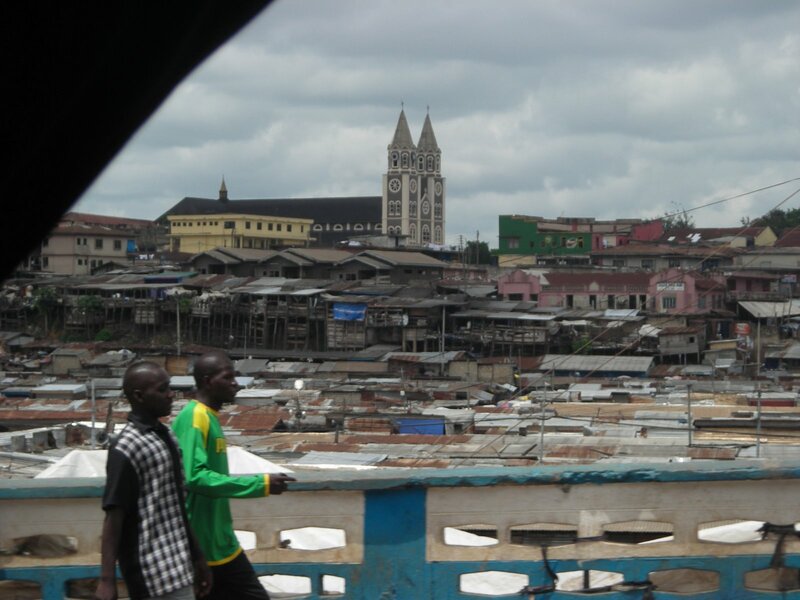 Is the G8 keeping promises in Ghana? we have passed so many road improvement projects that it is almost as if I am back in Michigan and experiencing the common ‘summer of orange barrels.’ Except that there is no such thing as orange barrels here, there is just random stuff in the road to divert traffic. The money and aid flowing into Ghana makes me wonder if there are any G8 promises not being kept here. The promises for keeping aid promises by G8 countries is rebuttled by the G8 calling for promises to be kept for good governance in Africa, and is again clashed with the argument by many African intellectuals to have foreign countries leave ‘development’ to the Africans. 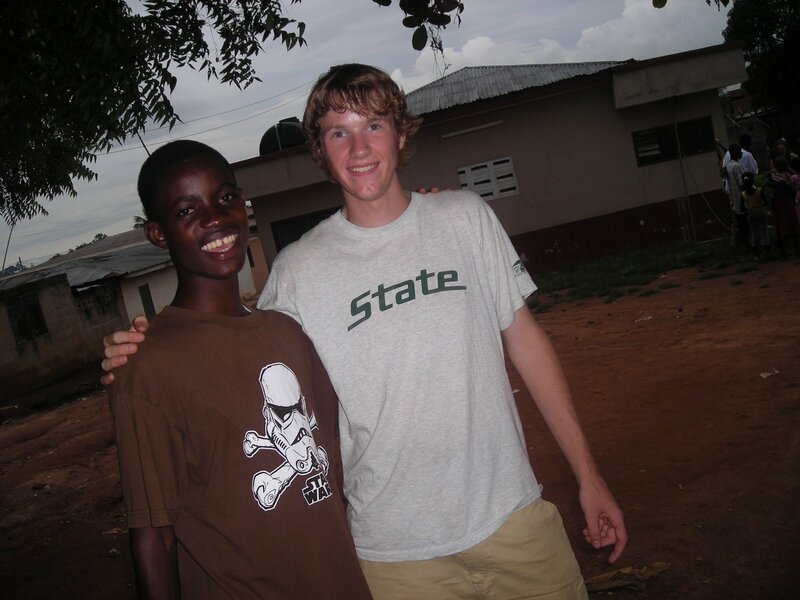 Check for new pictures of drumming and the Peace Corps in older posts. Yum. You know what I get for breakfast? Nothing. Or, sour yogurt. And if I’m lucky, leftovers from dinner the night before. 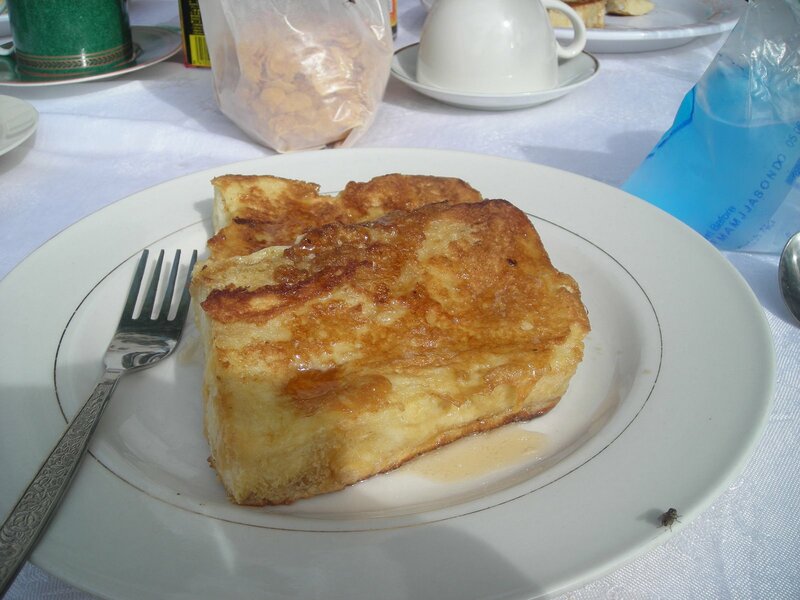 I would kill for some french toast right now. Next Next post: and the beat goes on. . .